Valuable reference tools for figure studies and still life compositions (as well as intriguing decorative objects in their own right), these classic 3-D sculptures are small and lightweight, making them ideal for classroom use. Each sculpture is sculpted in three dimensions. All are great for learning portraiture and drawing techniques. The Mini Torino Studio Sculptures are made of a combination of Titanium Dioxide, white gesso powder, Calcium Carbonate, and Gypsona. Head of David, Julius Caesar, and Socrates — Fixed on a base, these sculpted heads depicting Michelangelo's David, Julius Caesar, and Socrates not only provide model human faces but also bring history into your projects by providing examples from the Renaissance, Ancient Rome, and Classical Greece, respectively. Anatomic Head — Fixed on a base, this sculpture of a human head helps artists gain a better understanding of facial anatomy, muscles, and proportions. Skull — This upright sculpture of a skull is useful for studying bone structure. 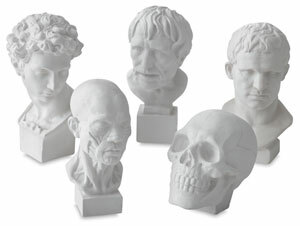 Anatomic Head 5" 2" 2½"
Head of David 6" 2" 3½"
Julius Caesar 6" 2½" 2½"